The Stuart Police Department is investigating an alleged accidental shooting. According to the department, officers responded to the call at 1:30am Tuesday to the 600 block of SW 7th Street at the South Summit Apartment Complex. Officers found a 17-year-old male with a gunshot wound to his leg. The injury was reported to be non-life threatening. 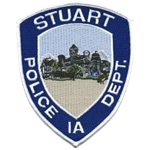 The teen was transported by Stuart Rescue to a Des Moines hospital for treatment. The extent and status of the injury are unknown at this time. Officials say the incident appears to be accidental. Due to the age of the victim, his name will not be released.